January | 2015 | Between Two Tides. L’ Entre Deux Mers: Land of Kings and Pilgrims. Salut, I write to you from between two tides, to tell a part of its story. It begins in the mountains of Auvergne, where deep waters spring to birth the Dordogne river. She tumbles her way through Limousin and Perigord, eventually flowing into the Gironde estuary on the south west coast of France. And to the south, the river Garonne rises in the glacial central Pyrannees. She falls rapidly northward, meandering through Toulouse and onward to the city of Bordeaux. Just beyond the city the two rivers meet and merge to broaden the estuary until they reach their destination, the Atlantic Ocean. As the sea ebbs and flows, so too the rivers have their tidal waves, famously called “Masceret”. In the triangular piece of land, tucked between the rivers as they converge, is a beautiful country called L’ Entre Deux Mers, its name derived from the latin “inter duo mario”, or “between two tidal rivers”. It is a land of softly undulating vineyards, farmland, orchards and forests. Fortified towns stand as testimony to the Hundred Year Wars when The House of Plantagenet, Rulers of England, fought to win possession of the Kingdom of France, against The House of Valois. While battles raged, christian pilgrims walked by, travelling from England, Germany and Northern Europe, on their way to Compostella in northern Spain, where Saint Jaçques’ remains were buried They nicknamed their path “The Milky Way”, while looking up to the sky for direction. At the end of each days walking a pilgrim could find refuge at an Abbey where monks provided food, drink and a place to sleep. Abbey monks throughout the land mastered the art of wine making, brought here by the Romans and it was only a matter of time, expansion, a port and priviledge given by the royal family, that the wines of Bordeaux became the most famous in the world. Today, the Gironde estuary and its region is a republic department of France, and little has changed. English folk still arrive on quests for land and home. Pilgrims still walk “Le Chemin de St. Jaçques de Compostelle”. Vignerons still work the land to produce wine. This is where I share a home with Jean Michel and a Berger Picarde called Argan. We live in a stone house, built in 1860. Outside live a menagerie of sheep, chickens, white pigeons, goldfish and wildlife. 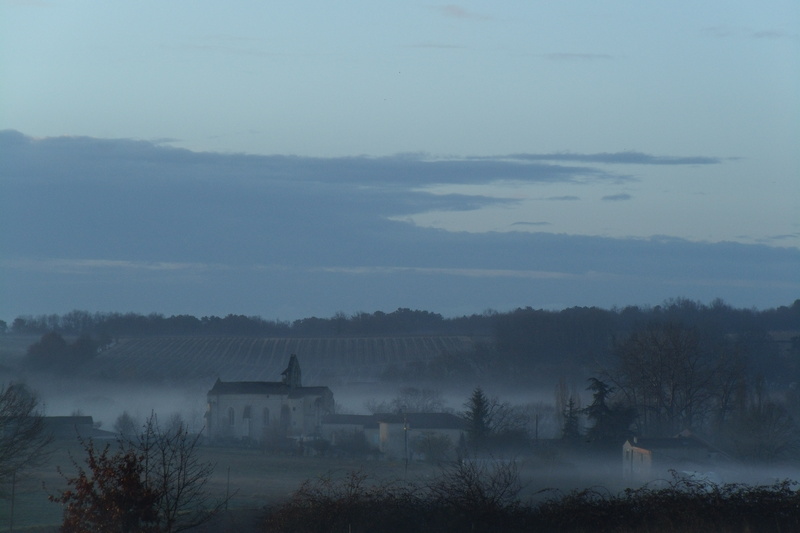 We are surrounded by vineyards, forests, bastide towns and romanesque abbeys. I hope that you will let me share some poems, pictures and stories from Between Two Tides.